When I was a young lad, I went to visit my some of my cousins. They were playing a game called Conker's Bad Fur Day in multiplayer. I joined in and had a total blast. 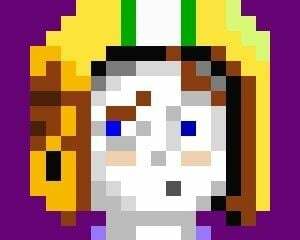 It was unlike any multiplayer game I had ever played. It was epic and grand. I was desperate for it. When I went home, I begged and pleaded with my parents to purchase a copy. Somehow, my convincing actually worked. My dad took me to the store and we picked up a copy. After seeing the game in action, my dad vowed to never buy me an M rated game again. I believe he's held true to his word on that. I paid out of my own pocket for every M rated game after that. Well, except for Doom 3. But that's another story. 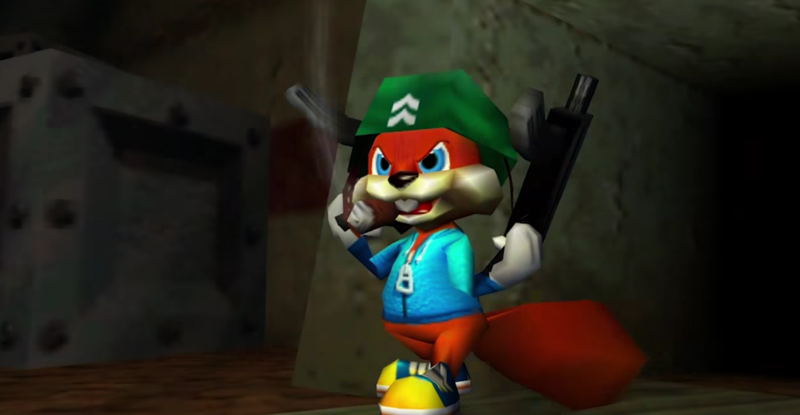 Looking back, Conker's Bad Fur Day on the Nintendo 64 is highly irreverent. It's very violent and profane. But it's supremely cartoony. There is blood, but it's essentially cartoon jell-o. It's mature, but in the silliest fashion possible. 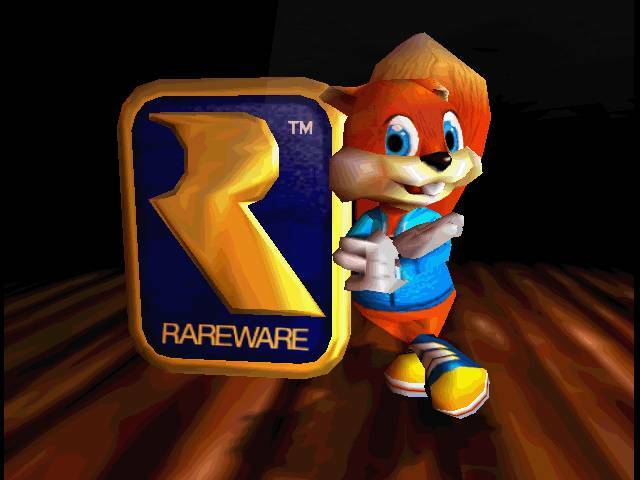 During the single player campaign, Conker goes on many adventures over the course of a single day. Near the end of the adventure, he somehow finds himself at war against actual Nazis. Well, not actual Nazis. Teddy Bears, or Teddies. Tediz, to be precise. An evil, mad scientist (who works for the evil king of the land) builds an army of fascist Teddy Bears. They're more or less alive. They speak German (or something very German-esque). They have gone to war against a Tediz' natural enemy: Grey Squirrels. Conker is a Red Squirrel, so you'd think he'd be in the clear. But sure enough, he finds himself invaiding the plush-stuffed beaches of teddy bear Normandy. The scene is a direct translation of the Normandy scene from Saving Private Ryan. It was actually my first exposure to the scene. As a kid, I certainly had not seen that film, and it would be several years before I would. So the scene is actually fairly horrific, but again, super cartoonish. It's very odd. I'm sure that many people would call it tone-deaf and/or inappropriate. Eventually you make it through the beach. You enter some of the toughest sequences of the game. There is a tank battle, a hallway sequence with a massive machine gun turret at the end, and of course a boss fight. There's even a dig taken at elevator music. Conker makes it through the battle and lives to fight another day. In the end of the game (spoilers), the king and the mad scientist are dead. Conker's victory is hollow. His beloved girlfriend dies. He becomes king of a very strange land and has no love with which to share his fortune and power. It could be argued that this is an appropriate ending for a victor in a horrible war. Victory is attained, but at incredible cost. So in some respects it is no victory at all. Let's talk about one of the greatest multiplayer modes in the history of gaming: Beach. Beach is an assymetric multiplayer mode. At one end of the map are three towers. The Tediz man weapons here. They usually have 2 soldiers. The have one bear on the Machine Gun Turret. The other bear can choose between a bazooka and a sniper rifle. Directly below them are two gates that they are defending. Their job is to kill as many enemies as they can and prevent the enemies from reaching the gates below. On the other end of the map is a beach. French Grey Squirrels land on the beach. They are refugess trying to escape to freedom from the tyranny of the Tediz. They run through the level and try to get into the gates without being shot or blown up by the Tediz. The catch is that they have no weapons. All they can do is run and jump. They do have some advantages. First, there are quite a few paths through the level. Second, in two or three locations throughout the map are speed boosts that let the squirrels run at great speed. Third is a button. If the squirrels reach this button and jump on it, the Tediz will explode. This will grant 10 or so seconds of peace to aid in reaching the gates. The other advantage the frenchies have are numbers. The Tediz simply cannot kill them all. They charge in with great numbers (relatively speaking) and all squirrels travel different paths. Many will die, but some will make it through. Aside from being supremely entertaining, Beach is also rather poignant. The plight of a refugee fleeing from nazis was once very real. It's frightening to face an enemy that is heavily armed while you are not. The enemy is content to kill you and your whole family. All you want to do is escape. This cartoonish, satirical game actually made me think and feel about the plight of refugees, and at a young age. Refugees are perpetually in the news. Thankfully, they aren't running from Nazis or Tediz, but their plight is often still impossibly dangerous and they just want to be safe. We'll likely never see a proper sequel to Bad Fur Day. But I hope that every gamer gets a chance to experience this in their lifetime. It is meaningful and endless fun. If you get the chance to play it in any form, please take advantage of the opportunity. Long live King Conker!